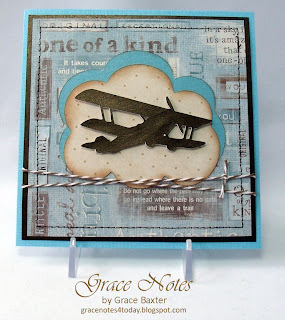 Bi-Plane Birthday card of Bygone Memories. Designed for an ex-pilot who loves vintage cars, boats and planes. 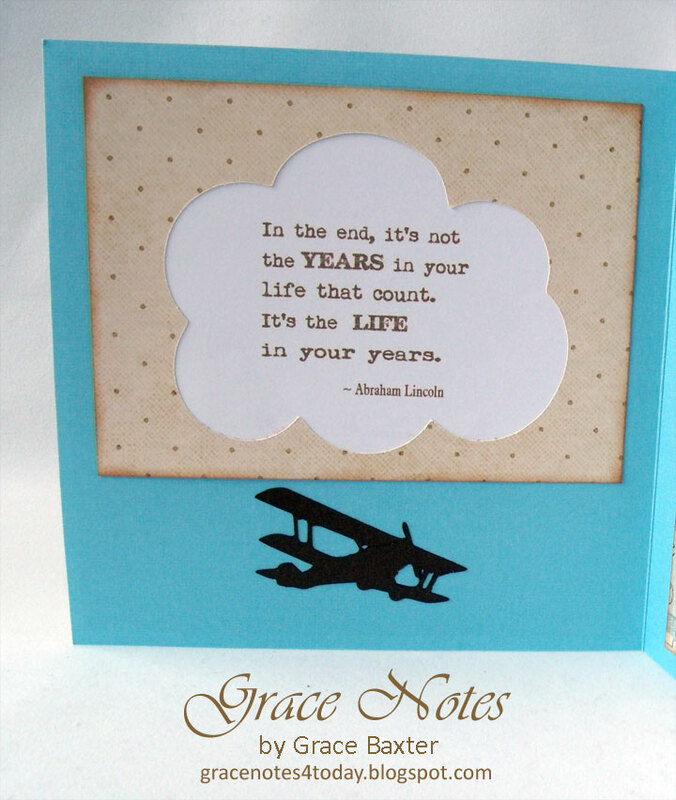 How appropriate that his birthday fell on Memorial Day and this card has a quote inside by Abe Lincoln. 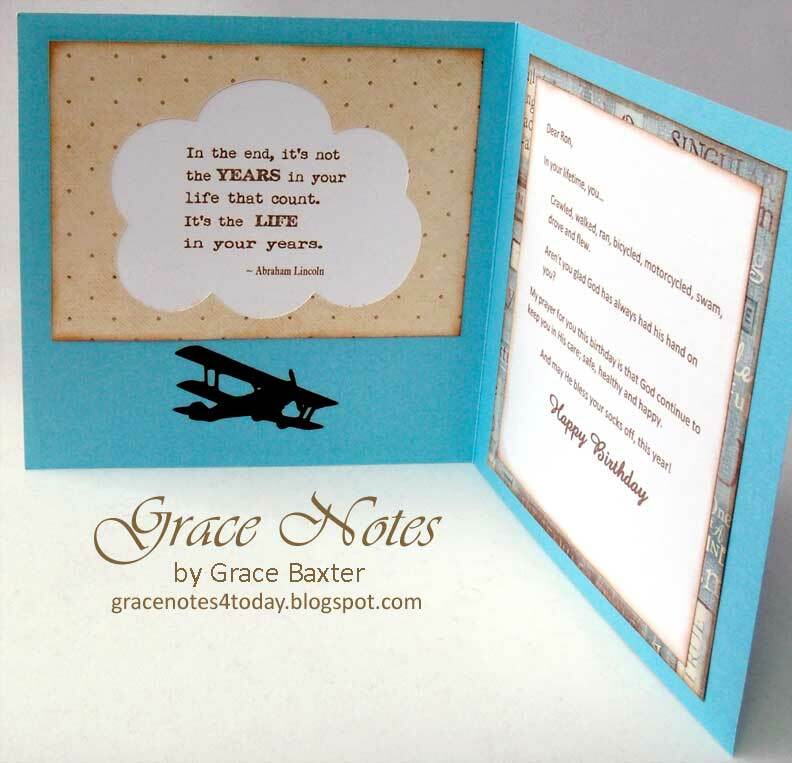 Design and poem by Grace Baxter. 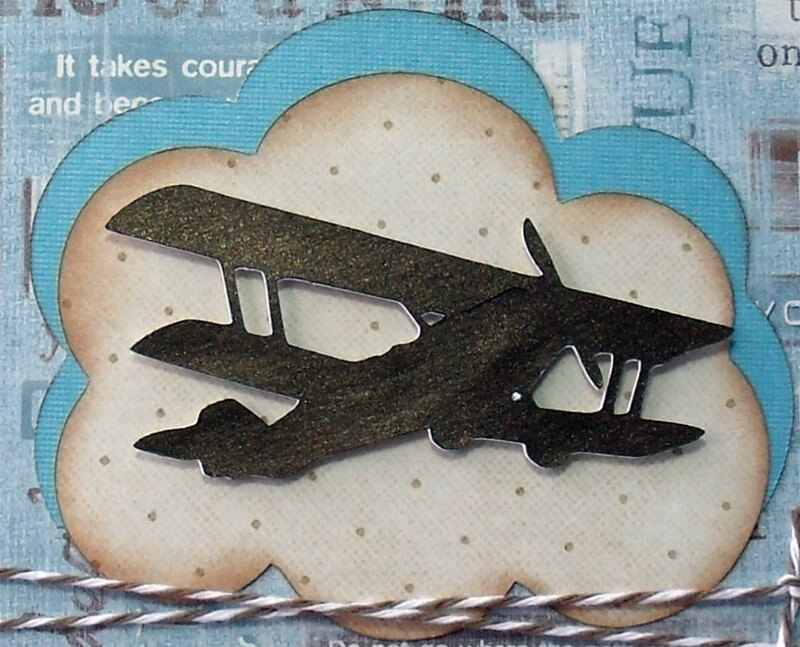 The recipient of this card is an ex-pilot who enjoys anything from yesteryear, particularly cars, boats, planes. So this card exudes "vintage". And how perfect that it should have a quote from Abraham Lincoln inside. First things, first. The card is 5-1/2" square. The plane is cut from a metallic-like CS that has both sparkle and shine. The pics don't do it justice. The same brown is used to mat the printed panel. Both these squares are stitched together on the sewing machine, in brown thread of course. In this close-up pic you can see bronze-like metallic tones of the cardstock. The bi-plane is from Heritage and the clouds are from Create a Critter. I designed the quotation for the left panel in PhotoShop. I love this program for its flexibility. I used vintage fonts to give it the right feel. To keep the cloud and plane theme going on the inside, I used the negative piece of dot-print paper as a frame for the quotation. It fits perfectly. Then I cut a small plane to match the big one on the front, from the same brown paper. To finish it off, I inked the edges and added twine for extra definition. I'm very pleased with the way this card turned out. please be sure to provide your email address. Your card is awesome. I love the layout, colors, sentiment, it turned out perfect! Is this card available fore sale, if so, how do I purchase it? Yes, you may order it. Please leave me your email address and I will contact you. Thanks!